Where I live Fall is in the air, and I had the urge to make soup today, soup sooths the soul and nourishes the body and boosting one’s resolve to face the chill of the day. 1. 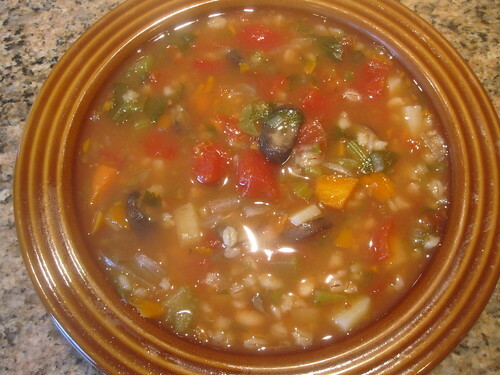 In a large saucepan combine the tomatoes, juice, water, onion, celery, parsley, green pepper, barley, and lima beans. Bring to a boil. Simmer, covered, 1 1/2 hours. 2. Add the carrot, mushrooms, salt, and dill. Continue simmering until the carrot is tender, about 20 minutes. Correct the seasonings and sprinkle on additional dill, if desired. I am about to make this soup. Hope it comes out as good as yours. I read what Shelley’s family thought of the shortribs. The ribs are delicious tell Shelley instead of changing the meat she should just change her family!